Secretary-General Boutros Boutros-Ghali of Egypt sits in his office on his first working day at the United Nations in New York City on Jan. 2, 1992. Boutros-Ghali has died at age 93. His career ranged from teaching law in Egypt to attending the historic Camp David summit of 1978 and then to leading the world&apos;s pre-eminent international organization. Former U.N. Secretary-General Boutros Boutros-Ghali has died at age 93. The diplomat&apos;s death comes days after news emerged that he had been admitted to a hospital in Cairo — an event that prompted Egyptian President Abdel-Fattah el-Sissito call Boutros-Ghali to check on his health. Boutros-Ghali&apos;s death was confirmed by the U.N. Security Council, which began today&apos;s session with a moment of silence in his honor. 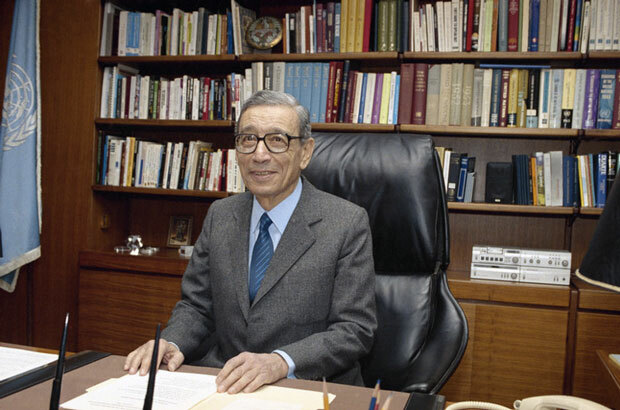 Born in Egypt in 1922, Boutros-Ghali was a member of a prominent Coptic Christian family. His grandfather and namesake, Boutros Ghali, had served as Egypt&apos;s prime minister from 1908 to 1910, when he was assassinated. During Boutros Boutros-Ghali&apos;s tenure leading the U.N., from 1992 to 1996, he sought to improve the organization&apos;s standing as the Cold War ended — as he grappled with crises in Somalia, Rwanda and the fragmented remains of Yugoslavia. "Boutros-Ghali found himself facing criticism from many quarters," NPR&apos;s Michele Kelemen reports for our Newscast unit, "and was often at odds with the U.S. The Clinton administration blocked him from a second term." Long before he was named to the U.N.&apos;s top job, Boutros-Ghali taught international law. In 1996, one of his former students wrote about what it was like to learn from the man many people simply called "Dr. Boutros." "Behind his back we had several nicknames for him. Graduates from English language schools referred to him as &apos;Peter Precious,&apos; an obvious play on his name — Boutros being the Arabic version for Peter, and precious is the English translation of Ghali. Colleagues from French language schools including the fabled Jesuits where Professor Ghali had studied as a schoolboy, referred to him simply as &apos;Bo-bo&apos; a nickname that would resurface at the UN years later."